MANILA, Philippines – The official results of Criminology Board Exam June 2018 or the Criminologist Licensure Exam (CLE) as well as the list of passers, top 10, schools' performance and other important announcements are released by the Professional Regulation Commission Board of Criminology twelve (12) working days after the last day of exams. Below is the complete list of passers for June 2018 CLE with surnames starting with letter A to H, courtesy of PRC. Criminology Licensure Exam is one of the programs with most number of examinees being administered by PRC. CLE is scheduled twice a year to cater the growing number of aspiring licensed Criminologists. For 2018, Criminology board exams are scheduled on June 2018 and December 2018. The board exams are administered by PRC Board of Criminology headed by its Chairman, Hon. Ramil G. Gabao at PRC testing locations around the country specifically in Manila, Baguio, Cagayan de Oro, Cebu, Davao, General Santos City, Iloilo, Legazpi, Lucena, Pagadian, Palawan, Rosales, Tacloban, Tuguegarao and Zamboanga. 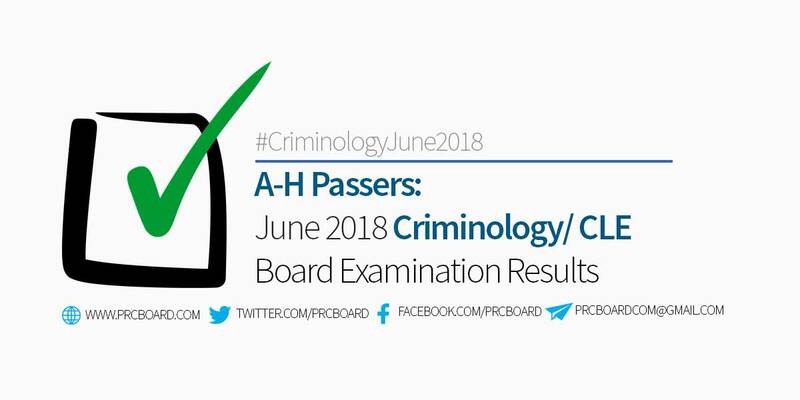 To receive up-to-date news on Criminology Board Exam result for June 2018, we advise our visitors to bookmark this page, visit PRC official website, follow us at our social media pages via Facebook and Twitter or join the members discussions at our Facebook Group. Mga what time kayo mag popost ng list of result maam? what time po lalabas ang result..? hapon na tagal ng result. Sna mkasama na din po pangalan ko sa list of passers. God bless us all. lord help us to pass this licensure exam of criminologist .. alam ko mabait ka sa amin ama. para matustusan yung hirap sa buhay ng aking pamilya. san na po yung result yung i pataas?? ?